Power saving modes limit your device's performance to conserve battery power. Choose between Power saving mode and Ultra power saving mode. 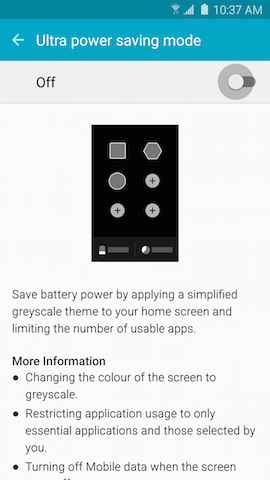 You can turn on Power saving mode manually, or set your device to go into Power saving mode automatically. 1 From the Home screen, touch Apps . 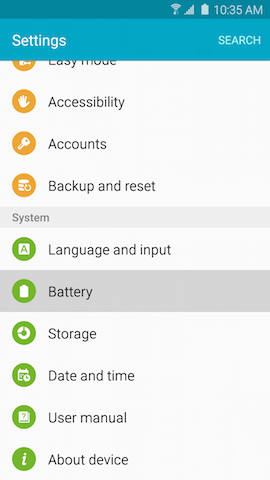 3 Scroll to and touch Battery under the System tab. 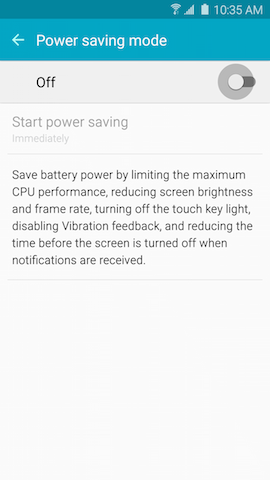 4 Touch Ultra power saving mode. 5 Touch the slider to turn Power saving mode on. 6 Touch Start power saving and choose Immediately, At 5% battery power, At 15% battery power, At 20% battery power, or At 50% battery power. *Based on laboratory testing. 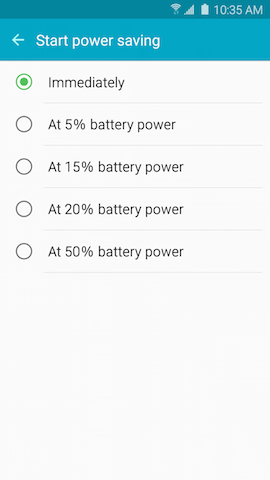 Battery power consumption depends on factors such as network configuration, wireless service provider, signal strength, operating temperature, features selected, vibrate mode, backlight settings, browser use, frequency of calls and voice, data, and other applications' usage patterns. 4 Touch Power saving mode. 5 Touch the slider to turn Ultra power saving mode on. 6 Mark the checkbox to agree to the Terms and conditions and touch AGREE. 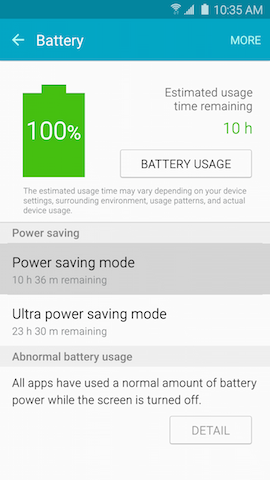 7 The Phone, Messages, and Internet applications are automatically available in Ultra power saving mode. Touch to make up to three more applications available. 1 From the Home screen, touch MORE. 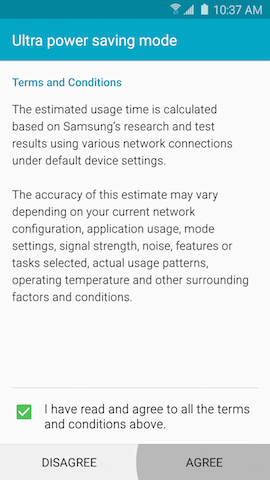 2 Touch Turn off Ultra power saving mode.